AODocs is fully integrated with the Google Chrome browser. The Chrome extension AODocs Smartbar brings AODocs features AODocs features directly into your Google Drive, Gmail and Google editor. The AODocs Smartbar is available only with a Google Chrome browser. Google Chrome allows you to sign into your browser with your Google Account to synchronize your bookmarks, extensions, history, passwords, and other settings on all your devices. Learn more about Google Chrome Sync: Get your bookmarks, passwords & more on all your devices. In Google Chrome you can also create different profiles that allow you to segregate different users. Learn more: Share Chrome with others or add a profile. In a Google Chrome profile, you can log in with multiple Google accounts. However, AODocs recommends that you log in to only ONE Google account per Google Chrome profile. This ensures that the data associated with your Google account is not mixed with data from other Google accounts, which often results in issues in the various Google services. Note: If Google Sync is enabled on your Google Chrome profile, use the same Google account to log in. 1. Access the Google Chrome website. 2. Follow the instructions to install Google Chrome. 1. In the top-right corner of the Google Chrome window, press the the character button. 2. Press Sign in to Chrome or Sign in again. 3. Enter your account email and password. 4. You can then link data or create a new profile. If you press Link data, your current bookmarks and settings will be associated with the account. If you press Create a new profile, you will start with a "blank" session with default settings. Tip: If you open the same session on other devices all the settings, bookmarks and history will be retrieved. - You can only associate a Google account with a Google Chrome session. - Once you have associated an account with a Chrome session, don't log into other accounts from this session. Use one account per profile. - If you need to use another account, associate this account with a new profile. 1. At the top-right corner of the Google Chrome window, select your account name. 3. A pop-up appears where you can set a new session by pressing Add person. 4. Set the session name and icon then press Save. 5. The new session opens. 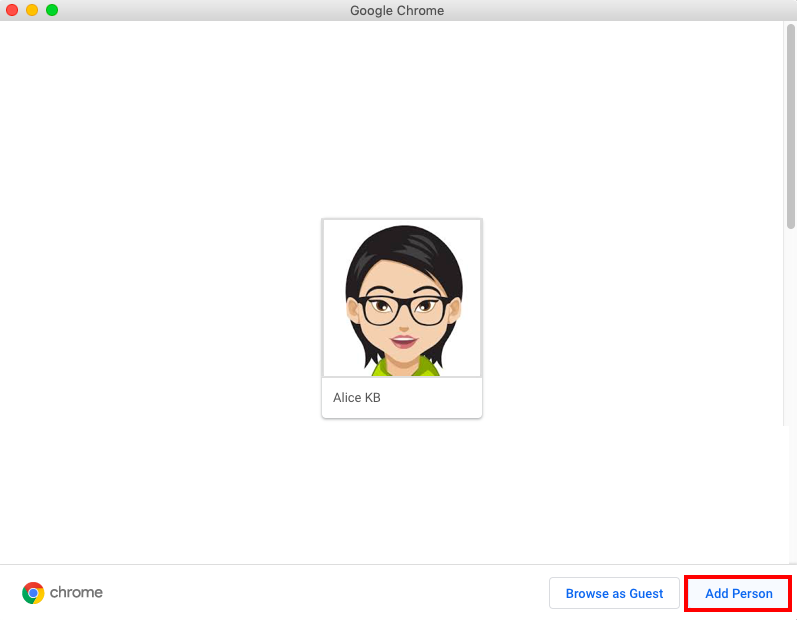 Reproduce the steps in Associate an account with a Google Chrome session. 6. You can then access the other session by selecting the account name at the top-right corner.